GoDaddy’s integration with Amazon, Etsy and eBay makes it the perfect choice for smaller retailers, however it’s lack of payroll features causes it to lose out to other accountancy tools on the market. GoDaddy is best known as a reliable and affordable domain name provider. What most people don’t realize is that they also offer a way to balance the books. 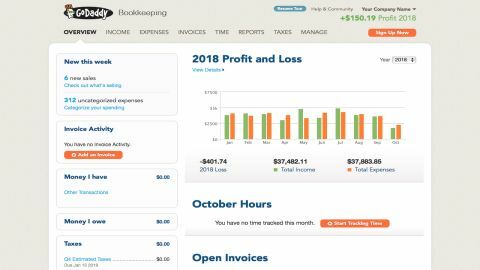 GoDaddy Bookkeeping offers a simple solution for smaller businesses who do not need overly sophisticated accountancy software. The platform is cloud-based, so it can be accessed from any operating system and to get started all you need is a GoDaddy account. For business owners on the go, GoDaddy Bookkeeping is also available for Android and iOS. Pricing is tiered depending on your level of usage. The software also works well with online retailers such as eBay and Amazon, making it ideal for managing a small home-based business. GoDaddy Bookkeeping has three price tiers. The ‘Get Paid’ tier is $4.99(£3.90) per month. Users can send invoices and estimates, track time and mileage, accept mobile payments and run reports. The ‘Essentials’ package starts at $9.99(£7.70) per month. It includes all the ‘Get Paid’ tier has to offer plus unlimited business reports, tac worksheets, automatic import of bank, credit card transactions and sales data from third party sites such as Amazon and eBay. The ‘Premium’ tier starts at $14.99 (£11.50) per month. Extras include recurring invoices. GoDaddy offers a 30-day money back guarantee. There is very little to do when it comes to setting up with GoDaddy. Users just need to create an account. Once you have purchased your chosen tier, you’ll be ready to get started setting up the platform to suit your needs. Users can add their details under the ‘Manage’ tab that runs along the top of the screen. Once all your details have been filled in, your company name will appear at the top right. Users can access a ‘Get Started’ checklist from their main homepage. From here they can choose to ‘Customize Reporting Categories, ‘Start Accepting Payments’ and ‘Link a Bank or Credit Card’. Users will need to enter their bank details into the system first. This way GoDaddy can link to your bank and download your most recent transactions. GoDaddy can estimate quarterly income taxes. This should be done as part of the setup process. Users need to assign income and expense categories to each transaction to utilize this feature. The interface is straight forward and easy to use. Users have easy access to sections such as ‘Overview’, ‘Income’, ‘Expenses’, ‘Invoices’ and ‘Reports’ through tabs that run across the top of the main screen. You can view new events, invoice activity and money owed through the ‘Overview’ tab. From here, users can also view a profit and loss chart for the current year. You can access categories, linked accounts, contacts, invoice settings and profile settings through the ‘Manage’ tab. Support is available through the ‘Help & Community’ tab at the top right of the screen. From here, users can choose to scroll through previously asked questions or they can submit a request of their own. While Less Accounting offers the most variety when it comes to reporting, GoDaddy does not have a bad selection of reporting templates. There are several options for business reports such as Profit and Loss and Sales by State. Income, top customer, top vendor and spending reports are also included. These are all under their own separate headings: Income and Expenses. The most variety is seen under ‘Invoices’. This includes reports for invoice status, invoice payments, expenses, top items and for timesheets. When it comes to billing, GoDaddy’s has some in-depth invoicing options. It surpasses the options offered by QuickBooks Self Employed accounting solution. Users can track invoices throughout their life cycles. You can set notifications to activate for when clients have opened their invoice. Similarly, users can receive notifications for when bills have been paid online. Users can also enable notifications for when invoices are overdue. The invoice forms include customer information, invoice number, purchase order number, date and balance. Each invoice includes the option to add any tax which is payable in total. Users can add a note to the client at the end of the form. There is also the option to include your company’s payment terms at the end of the invoice e.g. ‘please send payment within 21 days of receiving this invoice. All invoices can be previewed, however, unlike FreshBooks, users can’t work on the actual form the customer will receive. GoDaddy integrates with Amazon, eBay, Etsy and PayPal. This means that small businesses can easily link their sales from these sites to the GoDaddy platform. GoDaddy Bookkeeping has handy mobile apps for iOS and Android devices. This allows users to access most of the features available on the main version. Users can use the apps to edit invoices as well as view profit and loss charts. You can also access customer records and payment features. GoDaddy is the perfect choice for those who do not need an overly sophisticated accountancy tool. While it does include some excellent invoicing and reporting features, it does not offer double-entry and payroll which larger companies need. It is easy to use and is good value for money. GoDaddy’s integration with Amazon and eBay makes it ideal for small retailers and businesses but it lacks the in-depth tools of some of its competitors. Aside from ticking all the boxes for basic bookkeeping, GoDaddy’s software wins out due to being easy to use and integrate. It’s also truly cross-platform, being cloud-based and available for mobile devices. The 30-day money back guarantee ensures that you can try the platform risk free, so you can take that time to decide if GoDaddy Bookkeeping is right for your SMB.